Squishy Circuits – The home of all things related to Squishy Circuits, homemade conductive and insulating dough for playing and learning about electronics. Recipes, kits, and videos showing how to use Squishy Circuit dough to teach electronics. Sylvia’s Super-Awesome Maker Show about Squishy Circuits – Super-Awesome Sylvia explains Squishy Circuits to kids of all ages. Makedo – Wicked cool reusable connectors, hinges and child-safe saws for building cardboard constructions. Tapagami – Tapigami is “the art of applying imagination to tape” created by Danny Scheible. Cardboard making accessories – Makedo hosts a collection on Thingiverse of parts that you can 3D print or laser cut. These hinges, traps, and tools are perfect for cardboard constructions. Audacity – Free audio editor and recorder software. This is a must have! Tech4Learning – Kid-friendly art, animation, publishing and creativity software for schools. Pics4Learning.com – Database of free, copyright friendly photographs submitted by educators and students around the world. Animationish – Peter Reynolds’ easy-to-use animation program, complete with video tutorials. Wolfram Alpha – Online computational knowledge engine. The Green Screen Makerspace Project Book – By Todd Burleson. The projects in this book teach beginning to advanced greenscreen video techniques. A variety of software and hardware options make it a practical approach for all ages and budgets. There are many opportunities to combine making with video by making props, sets, and other necessities for video production. 101 Things I Learned in Film School – A terrific easy-to-read book by Neil Landau full of helpful tips and tricks for creating compelling videos or films. How to Photograph Your Life: Capturing Everyday Moments with Your Camera and Your Heart – This book by Nick Kelsh shows how to capture great photographs by comparing great examples next to terrible ones of the same scene. Making Real-Life Videos – A fine guide by Matthew Williams for teenage filmmakers. Pinhole Cameras: A DIY Guide – By Chris Keeney. A practical guide to making and using pinhole cameras. Edgerton Digital Collections – This collection showcases the pioneering photography of Harold Edgerton. There are galleries and resources for doing your own time lapse, stroboscopic, and other photography techniques. Screenplay: The Foundations of Screenwriting – Syd Field’s bible of screenwriting is a perfect text for high school students. Go Pro Cameras – Go Pro has a line of small, sturdy cameras built to strap onto helmets of extreme sports enthusiasts. This also makes them perfect for school projects where you want to put a camera on a robot or a weather balloon. The HERO3 is the latest and most affordable option – accessories are available separately or in more expensive bundles. Casey Neistat – Filmmaker Casey Neistat creates incredibly creative short videos using everyday cameras and simple, easy to reproduce production effects. 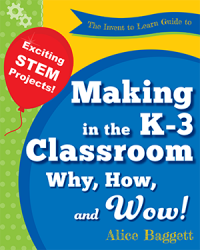 The Invent to Learn Guide to K-3 Making in the Classroom: Why, How, and Wow!